Nighthawk X4S AC2600 WiFi VDSL/ADSL Modem Router with MU-MIMO and Quad Stream technology delivers WiFi to multiple devices simultaneously for faster speeds. Get ultimate WiFi speeds of up to 2.53Gbps, with a powerful 1.4GHz dual core processor. 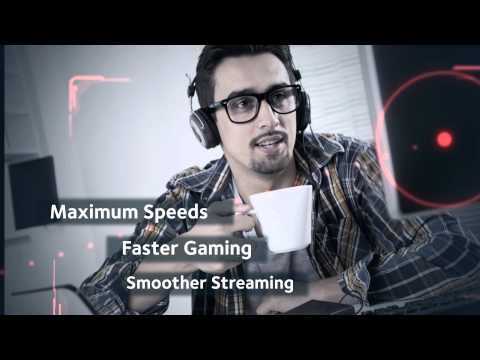 Enjoy smoother streaming and gaming by prioritizing application and device with Dynamic QoS. Includes auto detection for universal DSL support, compatible with VDSL, VDSL2, ADSL, ASDSL2, and ADSL2+. Take gaming and streaming to the next level. 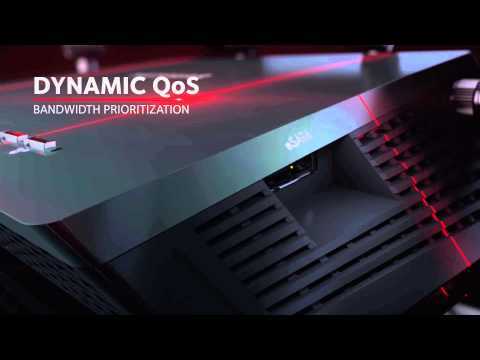 Multi-user MIMO (MU-MIMO) and Quad Stream technology delivers WiFi to multiple devices simultaneously for faster speeds while Dynamic QoS prioritizes Internet traffic by application and device for lag-free connections. Roam freely on your mobile devices with increased range from Quad-Stream Wave 2 WiFi. Beamforming+ and four high powered antennas and amplifiers increase coverage, dependability and performance. The twin USB 3.0 ports and eSATA port provide speed and flexibility when you connect your external storage to your Nighthawk X4S. Enjoy fast, wireless access to your high-capacity hard drives from anywhere. Then keep it safe with free ReadyShare Vault PC software and schedule automatic hassle-free backups to safeguard precious photos and files from any PC directly to the connected USB storage. • World's fastest WiFi: Up to 2.53 Gbps†. • Dual core processor: Dual-core 1.4GHz processor boosts wireless, wired & WAN-to-LAN performance. • Cable or Fiber: Also connects to cable modem via Gigabit. • VDSL MODEM: Compatible with VDSL, VDSL2, ADSL, ADSL2, & ADSL2+. Got range? Homes come in all shapes and sizes and the Nighthawk X4S AC2600 WiFi VDSL/ADSL Modem Router provides WiFi coverage no matter where you connect in your home. • Antennas: High-powered amplifiers with 4 external antennas. • Quad-Stream: Quad-Stream Wave 2 WiFi increases WiFi range for mobile devices. • Dynamic QoS: Delivers bandwidth prioritization by application & device. • Beamforming+: Focuses WiFi signals for stronger more reliable connections. on 2.4 and 5GHz bands. • DLNA®: Find and play your media on DLNA TVs, game consoles & media players. • ReadySHARE® USB access: Wirelessly access and share USB hard drive and printer via two high-speed USB 3.0 ports. • ReadySHARE Printer: Wirelessly access & share a USB printer. • ReadySHARE Vault: Free software for automatic PC backup to a USB hard drive connected to the router. • iTunes® compatible: Play your USB-stored music using AirPlay or Apple Remote™. • NETGEAR genie® App: Personal dashboard to monitor, control and repair your home network. • VPN support: Secure access to your home network when away from home. • Parental controls: Web filtering for all your connected devices. Features • Quad-Stream AC2600 WiFi for speeds up to 2.53Gbps (800+1733Mbps). • Next generation Wave2 WiFi. • Dual Core 1.4GHz processor boosts performance for gaming and streaming. • Built in high speed modem compatible with VDSL, VDSL2, ADSL, ADSL2, ADSL2+. • Auto Detection for Universal DSL Support. • Gigabit Ethernet WAN port for universal Internet service compatibility. • Twin USB 3.0 and eSATA ports for external storage. • Dynamic QoS bandwidth prioritization by application and device. • Manage your home network with NETGEAR genie. NETGEAR D7800, Nighthawk X4S AC2600 VDSL/ADSL Wireless Router, 800+1733 Mbps, Dual Band, 802.11ac, 5x GbE, USB3, eSATA is rated 5.0 out of 5 by 2. Rated 5 out of 5 by btbass from Good product. Using with BT infinity. Easy to setup, you just need your bt user name and password and the router does the rest to connect. Very strong signal through out the house. Vary fast with ac adapter, has worked without fault so far. Pleased with purchase. Rated 5 out of 5 by Mkmike19 from Excellent Product This product functioned exactly as it should when first setup. In my case, I needed the VDSL facility which influenced the choice. There are not many routers of this type. Once connected, I used the auto setup based on my broadband supplier (EE) and it worked straight away. It is a major improvement over the router supplied by EE not least because all 5 Ethernet ports are 1000BASE-T of which the EE router has only one. Owing to the complicated settings on this router, I am not sure that a manual setup would have been so successful.